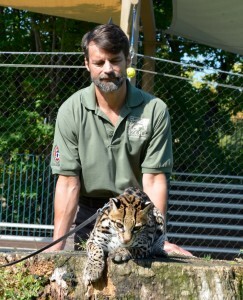 CINCINNATI, OH (October 13, 2015) – The Cincinnati Zoo & Botanical Garden is proud to announce that Dr. Bill Swanson, of the Zoo’s Carl H. Lindner Jr. Family Center for Conservation and Research of Endangered Wildlife (CREW), has been recognized by the American Association of Zoo Veterinarians (AAZV) with the prestigious Duane Ullrey Award for his work with endangered small cats. The Duane Ullrey Award recognizes exceptional achievements in the science of wild animal health. The award is given to non-veterinarians or non-clinical researchers who have used sound scientific principles to achieve significant benefits to wildlife. Honorees are chosen by a panel of prestigious veterinary colleagues with no input from the recipient’s place of work. “Dr. 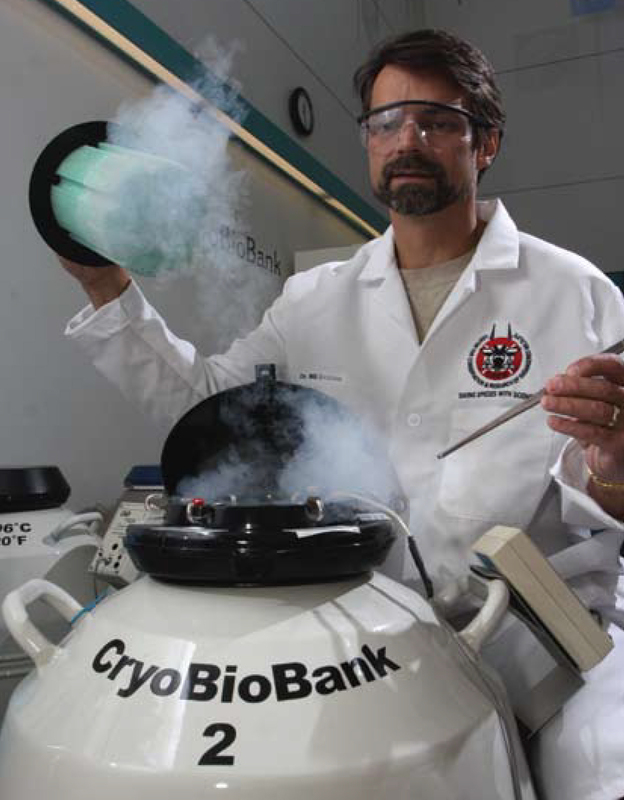 Swanson bridges the gap between propagation and in situ conservation and between research and clinical medicine,” said Michael R. Loomis, chairman of the AAZV awards committee. As CREW’s Director of Animal Research, a position he has held since 1997, Swanson is responsible for leading a multi-disciplinary research program that incorporates reproductive sciences with global ex situ and in situ conservation efforts for the preservation of endangered animal species. He is widely recognized as one of the world’s leading experts in developing reproductive technologies needed to bolster breeding programs for endangered small cats. Dr. Swanson is also passionate about teaching the next generation of wildlife researchers, and has shared breakthrough techniques and knowledge with colleagues in Mongolia, Thailand, South Africa, Brazil, Mexico and the United Arab Emirates. Appropriately, at the same meeting Dr. Swanson was honored, his most recent veterinary intern won the AAZV student competition award with her presentation on the production of kittens using vitrified sperm. “Bill is both accomplished scientist and committed conservationist, a combination that makes him a powerful force for wildlife. However, Bill never seeks attention for himself, so this award from his esteemed colleagues is just perfect and so very well-deserved,” said Dr. Terri Roth, Director of the Zoo’s Center for Conservation & Research of Endangered Wildlife (CREW). Swanson is the first Cincinnati Zoo staff member to receive the Duane Ullrey Award. List of previous Ullrey Award winners. 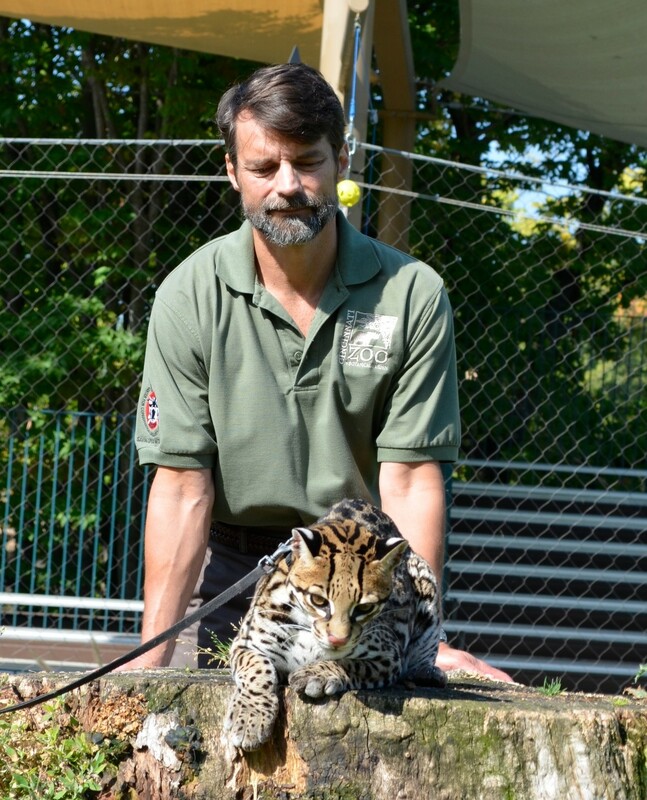 Cincinnati Zoo’s CREW is a global leader in wildlife conservation. Established in 1991 as the first institution of its kind focused on both plant and animal conservation research, CREW is dedicated to “Saving Species with Science”. World renowned for its accomplishments with its four Signature Projects – endangered rhinoceroses, imperiled small cats, exceptional plants and threatened polar bears – CREW also conducts substantial research with a few select other species. These conservation efforts, involving a diversity of scientific disciplines and multi-institutional collaborations, are expanding our understanding of species biology, enhancing reproduction and genetic management, and ensuring a future for wildlife.